Before going into details let first look at the high level architecture for the Web SDK to understand how it works. The major piece here is a computer that has a DYMO printer plugged-in and DYMO Label software installed. DYMO Label software contains a service called DYMO Label Proxy that allows communication between a web browser and the printer. Nothing should be installed on any other computing device that accesses the printer. That is the biggest difference from the current SDK where DYMO Label software must be installed on any client computer that needs label printing functionality. right now DYMO Label Proxy is available for Windows only. So, a printer should be connected to a Windows machine, or be available from Windows machine has DYMO Label Proxy installed (see below). the printer itself does not have to be connected directly to the computer running DYMO Label Proxy. The printer has to be ACCESSIBLE from that machine. This means that the printer might be really connected to a different machine and be a "shared" network printer. Or the printer might be connected to a DYMO Print Server and be "installed" on the computer using RAW TCP/IP port. This might be used to simplify installation (see below). a local network is used for communications between the proxy service and a mobile device. That means that on the mobile device the Wi-Fi should be turned on and the device should be connected to the network. Using just 3G is not enough. browsers that use an internal “proxy” servers to fetch internet content, e.g. Opera Mini, are not supported. The reason? 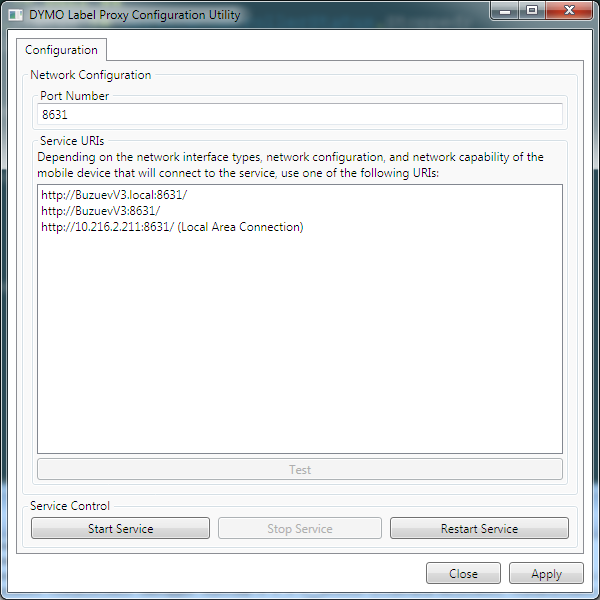 It is impossible to contact “local network” servers like DYMO Label Proxy from such browsers. The first scenario is printing from a computing device that DYMO Label cannot be installed on. This includes a mobile device like an iPad or Android as well as a desktop PC running e.g. Linux. The second scenario is to simplify installation on Windows. Before now DYMO Label has to be installed on a PC you wanted to print from. Not any more :) Let say you want to be able to print to a “shared” printer connected to a different machine. E.g. the printer can be connected to a “server” or someone’s workstation in a common location, like a "front desk". In this case DYMO Label has to be installed only on the "server" and nothing should be installed on your local PC, even drivers. DYMO Label Software will configure Windows Firewall to open the port 8631 for inbound requests. If a different firewall monitor is installed, you have to configure it manually. You can start/stop/restart the service from within the configuration utility. Alternatively standard “Services” panel of the “Computer Management" tool can be used. To be able to access the service, the service’s URI should be known on the mobile device. From a programmatic side it is done by calling a framework function addPrinterUri(); we will look at addPrinterUri() later when analyzing a sample application. But what URI to use? Well, it depends on various of factors, like network configuration, a mobile device type, etc. If you have a DNS server running on your network, e.g. the PC running the service is in a domain, then most likely you can use a second URI contains just a PC name, like http://. The goal was to modify API in a such way, so existing web applications that use the library should not require major changes. In many cases the only change that needs to be done to an application is to call dymo.label.framework.addPrinterUri() function to “register” the proxy service’s URI, so the framework knows how to communicate with the printer. Below is a short list of changes. Previously dymo.label.framework.checkEnvironment() function could be used for checking if the library can be used or not. E.g. it checked if the browser is one of the supported browsers, is DYMO Label software installed or not, etc. Now, because any browser can be used and DYMO Label software is not required to be installed this function is kind of obsolete. It is still a part of the library but it will return a correct result only if running on Windows or Mac assuming you are going to use a Framework dependent parts of the library (see below). 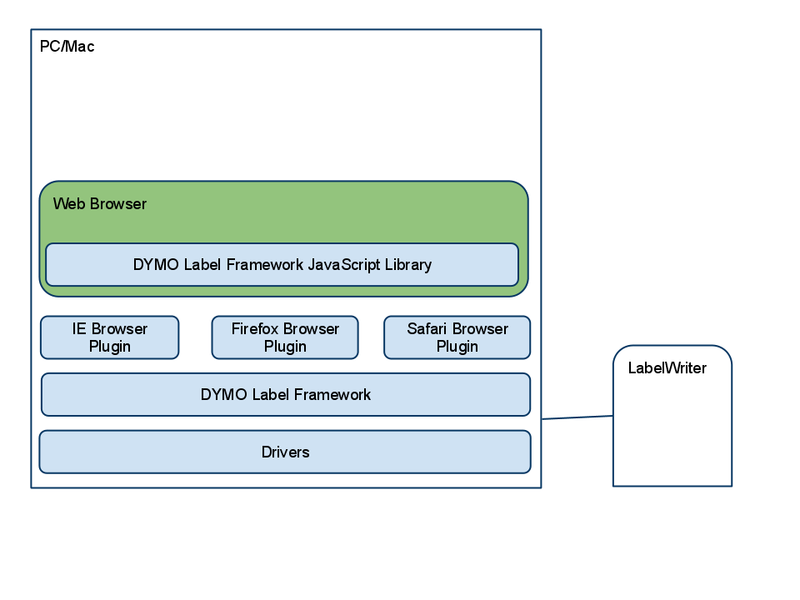 Some functions depend on a browser plugin and DYMO Label software being installed to operate. These functions access a local file system to load a label or an image file. If these functions are called when running on a mobile device an exception will be thrown. It is a good idea to call checkEnviromnent() first to make sure the functions can be called. The functions are dymo.label.framework.openLabelFile() and dymo.label.framework.loadImageAsPngBase64(). To be able to communicate with the printer , the library needs to know the DYMO Label Proxy service URI. To “register” a printer with the library, use dymo.label.framework.addPrinterUri() function. To “deregester” a printer use dymo.label.framework.removePrinterUri() function. Multiple printers/proxy services can be registered. To register a different service just call addPrinterUri() with a different URI. To deregister all printers use dymo.label.framework.removeAllPrinterUri() function. When printing from a desktop it might be not necessary to know the print status because the status can be easily accessed from the spooler UI. When printing from a mobile device it is not so easy. So, we added some functions for monitoring print job progress. dymo.label.framework.printLabel2() and label.print2() can be used to create a print job. An object representing a print job is returned by these calls and can be used to monitor the job progress by calling printJob.getStatus(). There is an utility function to combine both operations into one. It is dymo.label.framework.printLabelAndPollStatus() (and the correspondent label.printAndPollStatus()). Status checking function can be called for any printer, even if the application is running on Windows and printer is locally connected printer. Status checking for a printer locally connected to a Mac is not implemented in this BETA release. opt_location – optional string representing the printer location. A value passed in this parameter will be used as a part of printer name. If nothing is passed, then the host part of the URI will be used as the location. opt_successCallback – optional callback function called when the service has returned information about available printers. One parameter is passed to the callback – the printerUri of the service. opt_errorCallback – optional callback called when the service cannot be contacted, e.g. the service is down, or the printerURI is invalid. One parameter is passed to the callback – the printerUri of the service. For the sample, the printerUri parameter is taken from the printer url field. The opt_location is an empty string, so the host part of the uri will be used as a location. opt_errorCallback displays a simple message box telling the user about connection problem. opt_successCallback remembers the uri, so next time you opens the sample there is no need to reenter the uri (see below for more discussion). After that a printers drop down list is updated by updatePrinters(). In this case the ‘printers’ variable most likely will contain an empty array (or array with local printers only). Multiple proxy services can be added/registers at the same time. Just type a new service uri and click “Add” button. dymo.label.framework.removeAllPrinterUri() does the main job and the rest updates the UI. If you want to unregister one proxy service you can call dymo.label.framework.removePrinterUri() with the service uri as a parameter. An utility Settings class is used to store proxy Uris and the last used printer between sessions. In this sample, cookies are used as a persistent storage. In a real application other more reliable mechanisms should be used instead. DYMO Web SDK supports printing on both die-cut labels and tape labels. Label files for these two labels type are similar but different. So, the sample needs two label files for printing depending upon what printer is selected. Labels are fetched from files “Address.label” and “12mm.label”. This files are located on the server in the same folder as other files for the sample. The files are loaded using jQuery’s get() method. After label files are loaded, they are “opened” by using dymo.label.framework.openLabelXml() function; the resulting “label” objects are stored in addressLabel variable and tapeLabel variable. Type some data into the label text box and click “Print” button. The following is the function that does printing. It is a little bit long, but we will look at it part by part. First, the Print button is disabled during printing, just to make things easier. The printer name and text to print is taken from UI elements and saved in printer and text variables correspondingly. If no printer is selected, e.g. no proxy uri has been added, a error saying “Select printer” is displayed. Depending on the selected printer type a label to print is selected. Also a label object to put data into is selected. Then data to be printed is put into a label set object. Usually label sets are used to print multiple labels, but it is perfectly fine to use them to print a single label as well. In this case the same objects are used regardless of number of labels printed, so the code is easier to adjust. ‘printerName’ is the name of the printer to print on. Usually obtained by calling dymo.label.framework.getPrinters(). printParamsXml – printing parameters, in our case we pass null, so default parameters are used. ‘labelSetXml’ – label data to print. ‘pollInterval’ – interval in milliseconds to ask the proxy service for the job status information. In our case we use an one second interval. ‘statusCallback’ – status callback function called when the service returned status information. the callback takes two parameters; the first is PrintJob object. It can be used to get the status information on demand, without using polling. Also, it might be extended in the future to provide more control over the print job, e.g. an ability to cancel it. The second parameter to the callback is PrintJobStatusInfo class. PrintJobStatusInfo has two properties: statusMessage that contains a status message string; and status that contains status code. The callback has to return a boolean value. If true is returned, than pritnAndPollStatus() will poll the serivce again after the pollInterval passed. If false is returned, then printAndPollStatus() finishes processing. printandPollstatus() returns PrintJob object for the created print job. It has a little of use right now, but may be useful in the future if PrintJob is extended to support more operations. a string representing the printing status is assembled by using ‘Job status:’ prefix followed by real status string obtained from statusMessage property. determine if we should continue polling the service for the status or not. We stop polling the service when the status is either dymo.label.framework.PrintJobStatus.ProcessingError, that means something really bad happened and print job has not been even created (e.g. the label has an invalid format, or Windows spooler is not running , or DYMO Label is not installed correctly); or the status is dymo.label.framework.PrintJobStatus.Finished, that means the print job is completed. In addition to Label class methods, similar functions are defined in dymo.label.framework namespace. Function to be called when a print job status is available. The sample is minimalistic. It just contains a text area element to specify a text to be printed on a label and a button that triggers printing. In the future other versions will be available as well. It is OK to host the file on your own web-server. All printing code is in the printButton.onclick event handler assigned in PrintLabel.js. The print task contains three major steps: specifying label layout to print, setting data to print, selecting printer to print on, and actual printing. Before a label can be printed we should specify what is the label, what objects it contains, what are their positions, etc. It is done by “opening” a label. The easiest way is to put the xml string describing the label right into openLabelXml() function. The easiest way to obtain the xml is to design the label using DYMO Label software, saving it into a file, then pasting file content into the js code. In a real web application you would probably load the label definition xml from the server using some AJAX library instead of specifying it directly in a js file. The code sets the content for the object named “Text” to whatever is typed in the text area field on the page. Note: the library supports setting formatted/styled text as well. This ability will be reviewed in a different blog post. As you can see, label printing is not hard if DYMO Label Framework is being used. The Framework has a lot of other useful features, like multiple label printing, specifying image data for a label, specifying text styles, etc. These features will be reviewed in later posts. DYMO has just released a beta version of DYMO Label Framework – a new set of APIs to work with DYMO LabelWriter and LabelMANAGER printers. In this post we will briefly look at different parts of the Framework. All needed libraries and binaries are installed by DYMO Label v.8 installer. On Windows you will need to install version 8.2.3.1026 or later available on http://download.dymo.com/download/Win/DLS8Setup.8.3.1.1332.exe http://www.labelwriter.com/software/dls/win/DLS8Setup.8.2.3.1026-BETA.exe. Note: THIS IS A BETA VERSION for developers only. Please don’t install it on customer’s machines. On Mac DYMO Label version 8.2.2.1173 or later should be installed. It is available on http://www.labelwriter.com/software/dls/mac/DLS8Setup.8.2.2.1173.dmg. Documentation and samples are installed by DYMO Label SDK installer available on http://www.labelwriter.com/software/dls/win/DYMO_Label_v.8_SDK_Installer.exe. The Framework itself is almost completely written in C#, so .NET is “natively” supported. To start using it just reference DYMO.Label.Framework assembly. Below is a simple example shows how to print an address label. A compete C# sample is available on DYMO Label Framework/samples/C# Sample subfolder of the SDK installation folder. A VB.NET sample is available on DYMO Label Framework/samples/VB Sample subfolder. DYMO Label Framework allows easy label printing in many different environments. The APIs provided by the Framework will be explored in more detail in upcoming posts.